What's a bidet? Bidets (pronounced bee-days) are bathroom fixtures that are popular in Europe and other parts of the world. The bidet gently washes you after you use the toilet, leaving you clean and shower-fresh. Bidets are great for anyone, but especially for people with reach problems, or those who suffer from itching or hemorrhoids. Large porcelain bidets cost hundreds of dollars, need special installation, and take up precious bathroom space. Amplestuff's Porta-Bidet (Model B) is inexpensive and easily installs under nearly all toilet seats. 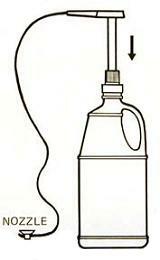 Just fill the polyethylene tank with tap water from the tub or sink, and screw on the pump. When needed, the water is hand-pumped to the spray nozzle held under the seat by a suction cup. With the two-quart tank, it's portable enough to take when traveling. Made in USA. 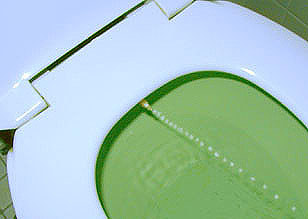 The Porta-Bidet is owned by many satisfied customers, who use it at home, in hotels, and even in the hospital. It can even pay for itself in decreased usage of toilet paper. It's gentle, soothing, refreshing. Many customers have said, "I don't know how I did without it." Immediately after a bidet tank is filled, the water is the same temperature as that used to fill it, whether that be warm, lukewarm, or cold. After a few hours, the water ends up at room temperature. While it is possible to fill the tank with warm water, most bidet users find room temperature or even cool water to be more soothing. Moreover, if the user has any hemorrhoids, cool water is much more soothing than warm water. The Porta-Bidet with a one-gallon tank is best for home . . . The Porta-Bidet with a two-quart tank is best for travel . . . If you already own our bidet and want a backup tank, they are available below. Or you can buy one unit with both tanks now, save $1.50, and use it for both home and travel . . . Satisfied Customers Write . . .